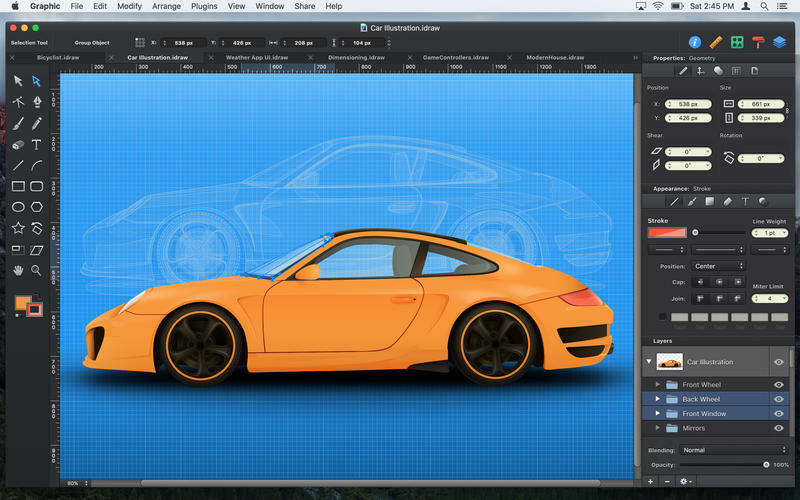 Autodesk Graphic is a modern full-featured graphic design and illustration application, created specifically for Mac OS X. Packed with many powerful features, and designed to be easy to use, you can use Graphic to create everything from simple diagrams to intricate detailed vector artwork. Import and export SVG, PDF and Photoshop PSD documents, creating simple workflows with other applications. Import SVG, PDF, EPS, and Photoshop PSD files. Export designs as SVG, PDF, PNG, PSD, JPEG, GIF, and TIFF files. Copy selected objects as PNG, PDF, SVG, CSS properties, and Core Graphics code. Export icons, bitmap and vector images directly into Xcode xcasset folders. Export layers and tagged objects automatically as individual files. Import layered PSD files with vector paths and effects. Shape layers are imported as editable vector paths. Layer effects are imported as fully editable drop shadows, inner shadows, glows, etc. Export designs as layered PSD files. If you need more information please contact the developers of Autodesk Graphic (Autodesk, Inc.), or check out their product website.